They are a really nice thick wedged chip they taste great with a bit of extra salt and and a side of sauce really great snack! 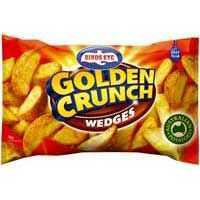 The Birds Eye Gold Crunch Potato Wedges are fantastic. I love the crispy crunchy outside with the soft potato inside. Great on their own or with a meal. Serve with tomato sauce, sweet chilli or sour cream. A winner in our household. Great for party platters as well. The birds eye potato wedges have such a great crunch, perfect when paired with sweet chilli sauce and sour cream, great as a stand alone meal! A perfect wedge with great crunch on the outside and lots of soft fluffy potato inside. Perfect with sweet chilli sauce and sour cream. So easy to cook and so much cheaper than buying potato’s these days. They bbq nicely straight from frozen or if you like hot and soggy just microwave and top with gravy or sauce. These are great for Friday nights watching The football! Super easy dinner served with sweet chili and sour cream they are crunchy on the outside and really soft and fluffy on the inside – perfect! I love these, they cook up really nicely my favorite brand of frozen wedges. Amd the whole family loves them also, and are often on special. I LOVE wedges…..and from the ones available at my local Coles, I’ve found this brand to deliver the best, tastiest and highest quality potato wedges. I always have frozen wedges in my freezer. They can always be relied on to make a satisfying snack for male/female and all ages. My favourite dipping sauces/condiments for wedges are sweet chilli sauce & sour cream….. The only negative I can pick, is that I wish they had bigger, bulk buy packs….because if you have 4 or more people chowing down on these….they don’t last long & your always wanting more. Birds Eye Potato Wedges Golden Crunch is very good quality wedges. Crunchy outside and soft inside. It’s easy to cook, and I love dip in sour cream and sweet chilli sauce! Birds Eye potato wedges are a great change from regular chips.They are golden and delicious and are perfect with dipping sauces and sour cream! Yum! How would you rate Birds Eye Potato Wedges Golden Crunch?